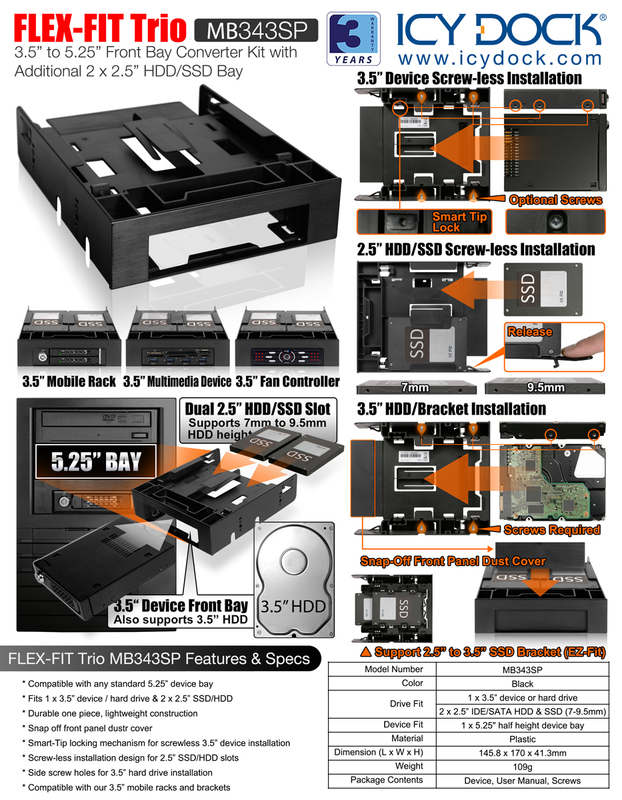 The FLEX-FIT Trio MB343SP is a very unique 3.5” to 5.25” front bay adapter. At first glance is of what looks like a simple 3.5” to 5.25 device bay adapter, but there is more than meets the eye. We’ve created a device that utilizes a single 5.25” bay and converts it into 2 x 2.5” HDD/SSD slots and a 3.5” device or hard drive bay designed for tool-less drive installation. The FLEX-FIT Trio MB343SP pushes the envelope with its unique features and brilliant engineering. As a result, you get a beautifully crafted adapter that is sturdy, flexible and multifunctional.